The phrase “top of the flood” conjures a catastrophic event involving an ark, but Tosh Brown’s new book is not an end-of-days thriller. It is a contemplation of his half-life on the water. 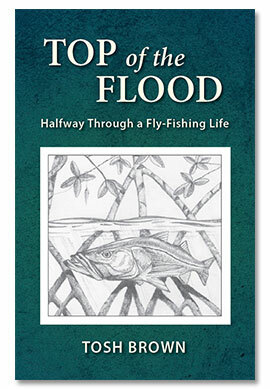 Top of the Flood is a breezy swoop through one person’s growth and maturation as a person and as an angler. There are funny stories, there are personal stories, and there are candid heartbreaking bits. The stories are told mostly in chronological order, so we follow the author’s progression from a youngster to an adult. During this progression Brown notices a pattern that most of us can relate to: there’s freedom when we’re little kids; expectations increase in young adulthood; we age into the sweaty fretful H.I. McDunnough years; and then, a bit later, there’s a re-acquisition of freedom. Brown, who grew up in Texas, describes his book as a “wobbly timeline of fishing stories,” a phrase that cannot be improved upon. The stories include recollections of successes and failures, fish caught and not caught, lessons learned with age, and all of these are inflected with Brown’s humility and sneaky humor. This is a kid’s paradise, right? Even though Brown doesn’t talk about chasing crawdads (all kids love crawdads), it seems like he had an acceptable childhood, although it was one that doomed him to a lifetime of angling. Early in his book, Brown describes the phases anglers go through in their development. He notes, in his unimposing way, that at first you just want to catch everything in sight, no matter the method, no matter the type of fish. Then, when this gets a bit old, you either quit fishing or you start seeking out quality fish, meaning the biggest in the neighborhood. You sacrifice catching 20 10-inch browns for one or two 20-inchers. You start to notice birds, and trees, whether a storm is imminent, that kind of thing. Surroundings become a large and enriching part of the experience. Then, while you’re enjoying all the conifers and lightning, you slide into the unconscious practice of fishing the way you want to fish, for the fish you want to catch. This is not a simple concept. Depending on the angler, the fish of the day could be a 2-pound bonefish tailing in skinny water 80 feet away; a muskie that has consistently followed your fly but never eaten it; or a little trout feeding on PMDs – a fish that you should have been able to catch at will – but which trout is now bringing you to your knees with frustration. There are a few bits in the book that don’t work, namely the reverse-chronology story. It’s just a few pages, and it has lots of great details, but the artificial structure makes it seem contrived, which it is. There are also segments about tumors, and illness, and then more tumors. These pieces lend gravity to Brown’s book; they do not derail it or make it a depressing read. Finally, and probably to the relief of dermatologists everywhere, Brown gives excellent sun-protection advice: whether you’re in the cold Oregon sun or under a blazing Keys fireball, take the sun seriously. Cover up and lather up. Brown’s book is a fun read, and he comes across as a charismatic person. Anyone who enjoys his photography (= everyone) should check out this book.